Vedantu.com - No.1 online tutoring company in India provides you Free PDF download of NCERT Solutions for Class 11 Biology Chapter 21 - Neural Control and Coordination solved by Expert Teachers as per NCERT (CBSE) Book guidelines. All Chapter 21 - Neural Control and Coordination Exercise Questions with Solutions to help you to revise complete Syllabus and Score More marks. Register for online coaching for AIPMT(NEET), Engineering and Medical entrance exams. NCERT Grade 11 Biology Chapter 21, Neural Control and Coordination is from Unit 5, Human Physiology. In this chapter, students will learn about the neural system of human, mechanisms of neural coordination like transmission of nerve impulse, impulse conduction across a synapse and the physiology of reflex action. Neural System, Human Neural System, Neuron as Structural and Functional Unit of Neural System, Central Neural System, Reflex Action and Reflex Arc and Sensory Reception and Processing are the main topics discussed in this chapter.Similarly, Generation and Conduction of Nerve Impulse, Transmission of Impulses, Components of the CNS; Forebrain, Midbrain, Hindbrain, Spinal Cord, Autonomic Nervous System, Peripheral Nervous System and Sense Organs like Ears and Eyes are discussed in this chapter. Structure, location and function of various organs of the Human Nervous System like brain, spinal cord, nerves, etc. is explained with the help of diagrams and comprehensive text. Mechanism of impulse conduction, mechanism of vision and mechanism of hearing are explained in this chapter in a very interesting manner. 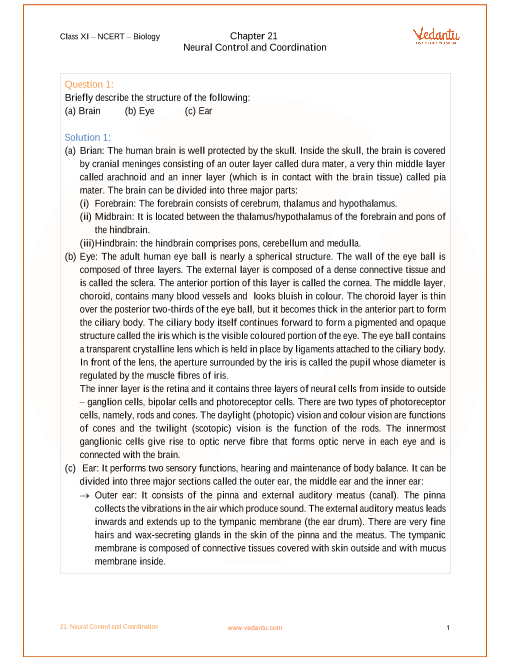 NCERT Grade 11 Biology, Chapter 21, Neural Control and Coordination is a part of Unit 5, Human Physiology. Unit 5 is a combination of 7 chapters and holds a total weightage of 20% in the NEET examination and 18 marks in the final examination. Get 100 percent accurate NCERT Solutions for Class 11 Biology Chapter 21 (Neural Control and Coordination) solved by expert Biology teachers. We provide solutions for questions given in Class 11 Biology text-book as per CBSE Board guidelines from the latest NCERT book for Class 11 Biology. The topics and sub-topics in Chapter 21 Neural Control and Coordination are given below. EX 21.6.2 - The Ear. Chapter 21 Exercises - 12 Questions with Solutions. Other than given exercises, you should also practice all the solved examples given in the book to clear your concepts on Neural Control and Coordination. Download the free PDF of Chapter 21 Neural Control and Coordination and take the print out to keep it handy for your exam preparation.